1. The fleet is more spread out. This means it will be harder to pass (and harder to lose!) other boats. There also may be some boats up ahead that you can watch for wind shifts and wind pressure. 2. 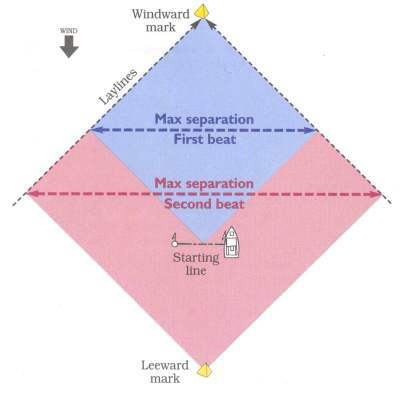 The second beat is usually longer because the leeward mark is often set to leeward of the starting line. This means the fleet will get farther apart on this leg. It will be harder to cover, but also possible to get more �leverage� if you�re trying to catch up. 3. You are closer to the finish of the race, which affects the amount of risk you�re willing to assume in tactics and strategy. 4. The second beat may be affected by boats still sailing on the previous reach to run. This means you must catch for a different variety of bad air, disturbed water and potential obstructions. 5. The wind and water may seem exactly like they were on the first beat, but it�s later on the day and conditions are always changing. So don�t assume everything is still the same. Because of all this you must view the second beat as a unique animal. To be fast and smart, you need a fresh perspective on boat-speed, tactics and strategy. Strategizing for the second beat is a lot like planning for any other leg. You strategy (the plan you make for getting to the windward mark as quickly as possible) should be in place before you round the leeward mark. It doesn�t have to be too complicated, but it should consider a number of factors like wind velocity, wind shifts, current, waves and the location of the next mark (but not the presence or actions of your competitors). One of the good things about planning for the second beat is that you can draw from a lot of recent history. Since you have been racing for at least the last half hour, think back on patterns you�ve been seeing in wind velocity and directions. What do you do for the next 15 to 20 minutes? Often you can use information about what happened on the first beat. If the boats that were leading at the windward mark all came from the right side, for example, the you should probably consider that side of the second beat (especially if their gain was due to a geographic wind effect). You shouldn�t just blindly bang the right corner, though, because the wind conditions are always changing - and maybe the left side will be favoured this time. You can also use your observations from the run or reach that you just sailed. You have to be careful, though, because it�s usually harder to keep track of wind shifts when you�re going downwind. Also, sometimes the side of the course that�s favoured on a run will be unflavoured on the next beat. This could happen for example, when gains are due to wind direction. �go left� or �go right.� You just need to keep you on track as you sail up the beat. Let�s say, for example, that you are on a port tact, converging with a starboard tacker. You decide to keep clear by tacking, but as soon as you get on starboard tack you realize that you are now headed for the wrong side of the course. If you had been thinking �go right� as you approached the other boat, you could have ducked them and kept going toward the favoured side. Here are some other tips and ideas about strategizing on the second beat. Remember that the wind and other variables are always changing. The plan that you put together before the leeward mark may no longer be valid when you are half way up the leg. So keep your heed out of the boat. One good thing about the second beat is that the fleet gets pretty spread out and there are boats all over the course to help you see wind shifts and identify which side is paying off. Because the leeward mark is often set to leeward of the starting line, the second beat is usually longer than the first beat. This means that the �corners� of the course are farther apart the second time around, especially in light air( when tacking angles are wider) and for boats that don�t point especially high to begin with. Strategically, this is challenging because the fleet tends to spread out a lot more, and you have a much wider choice of where to go. It generally makes staying ahead more difficult because it�s harder to stay close to the boats behind. On the other hand, it makes catching up potentially easier because it�s not so hard to get �leverage� (separation) on the boats ahead. There are some strategic rules of thumb that seem to work every leg- of the race. These are especially important for the second beat. Sail the longer tack first - This is always number one on my list because it usually works so well. By sailing on the tack where your bow is pointed closer to the windward mark, you�ll stay away from more corners of the course. More important, you will increase your odds of benefiting from the next windshift, especially when you�re not sure which way it will go. Stay away from laylines - This is a really good corollary of the principle above because you won�t get to a layline if you sail the longer tack. Laylines are usually bad because once you get there you can�t play the shifts any more , and other boats may tack on you. Of course, you can�t avoid the laylines forever (or you�ll never get to the mark) - just try not to spend too much time on your final approach. 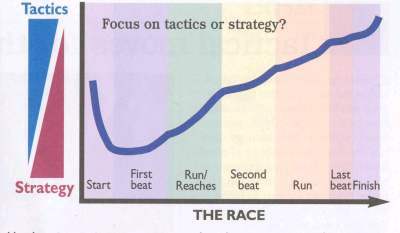 Here�s an interesting way to compare the relative importance of tactics and strategy during the course of a race. OK, this is grossly oversimplified. But the point is that, except for the start and mark roundings, you should usually focus more on strategy early in a race and more on tactics later in the race. Sail toward the next shift - If you can figure out where the wind will shift next, just sail in that direction and you will end up on a higher ladder rung. This works for both shifty and persistent winds. It�s hard to think about strategy without also considering the level of risks you�re willing to assume during the leg you are planning. For example, if you decide you like the right side of the second beat, does this mean you will go all the way into the right-hand corner, or just slightly to the right side of the rhumbline? Your answer depends on a number of different factors including your current position in the race and the overall series. Plan for the windward mark. 1. Locate the leeward mark visually before you round the windward mark. Which jibe looks longer? Will you be able to fetch the leeward mark on either jibe? 2. Plan a strategy for the run. What is happening with the wind pressure and direction, and the current? Do you like the left side or the right (looking downwind)? 3. Decide on a bearaway set or a jibe set. This depends on many factors like the wind velocity (don�t jibe set in light air), favoured side of the course, and the longer jibe. Another consideration is the side on which you have your spinnaker. If it�s on the port side and you will round the mark to port, you may have to do a bearaway set unless you are able to move the chute to the other side before the mark. Also, if you are planning to do a jibe set, make your approach to the mark on starboard tack since a tack-jibe-set is usually slow.